So, let’s start there. 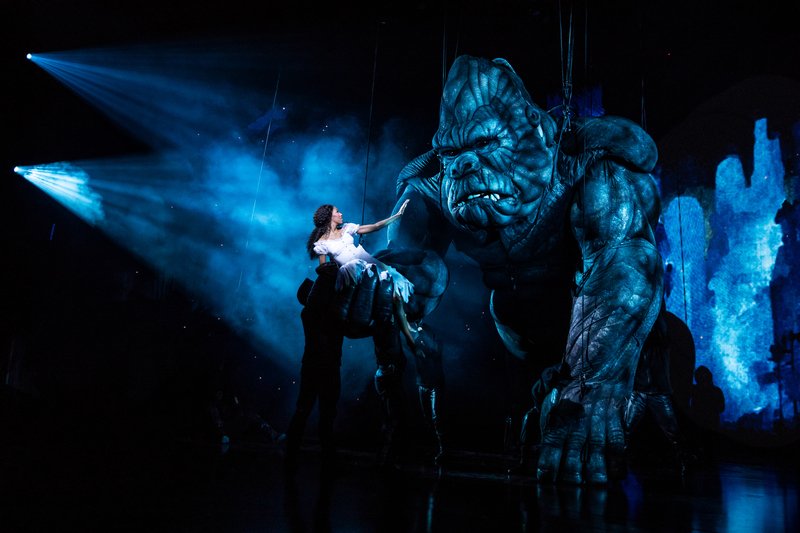 The most recent retelling of King Kong opened on Broadway this week. The $35 million Australian import features a 20-foot, 2000-pound puppet, although puppet seems like too uninspired a word to describe the beast that is this Kong. This mammoth marionette is skillfully propelled by a company of ten athletes, all visible on stage, who manipulate his arms, legs, and body. An additional team of four puppeteers is stationed in a booth offstage (affectionately referred to as the Voodoo Box) and control Kong’s wistful facial expressions and voice using radio signals and a joystick. It is a wonder to watch and creature designer Sonny Tilders, along with the masterful puppeteers, deserve commendation and applause. Adding to the visual feast are Peter England’s artsy screen projections. I am not usually a fan of projected images onstage, but England’s gorgeously augment the action. There is a scene in the first act when the cast is traveling by boat to Skull Island that, coupled with England’s projections, is simply breathtaking. Finally, chalk one up for Drew McOnie’s high-octane choreography which is energetic, acrobatic, and dynamic and opens the show on a high note. Unfortunately, that’s where the accolades end. The plot, which follows the 1933 movie with few exceptions, is paper thin. Yes, book writer Jack Thorne, has attempted to update the classic story by the reimagining the character of wannabe screen queen Ann Darrow. He makes this Ann Darrow, nimbly played by Christiani Pitts, a modern, independent badass, reminding us to the point of ad nauseam that she is no damsel in distress. Yet, this same character, who can take down a shipload of men and free herself from the claws of Kong, ends up making decisions that are unjustified and counterintuitive to her tenacious persona. In fact, all the characters seem underdeveloped and one dimensional. Yes, Eric William Morris is believable as the cunning creature feature filmmaker Carl Denham. And Erik Lochtefeld’s poignant portrayal of Lumpy is likable. But not even this adept cast can save the botched book or disjointed, unimaginative score. The biggest mistake with King Kong is the fact that the Australian team may have sadly underestimated American audiences and erred on the side of spectacle over substance. Still, if it is a spectacle you want, King Kong won’t disappoint and could be just the ticket. King Kong is now playing at The Broadway Theatre, 1681 Broadway, New York, New York. Performance times vary; check the website at King Kong Broadway. Find more information about current plays in the Chicago area on our Current Shows page and at theatreinchicago.com.